I’ve never seen an opportunity with as much profit potential as the legal marijuana market has right now. Legalization is inevitable. It’s happening. And it’s about to unleash a $150 billion market that was previously underground. Those profits are up for grabs. In the coming months, as marijuana emerges from the shadows, investors in the right positions will make life-changing fortunes. Marijuana, as I’m sure you know, is a psychoactive plant. It produces feelings of euphoria and relaxation. It also has countless medicinal benefits. For example, marijuana can help treat chronic pain and epilepsy. However, marijuana is still illegal in most places. 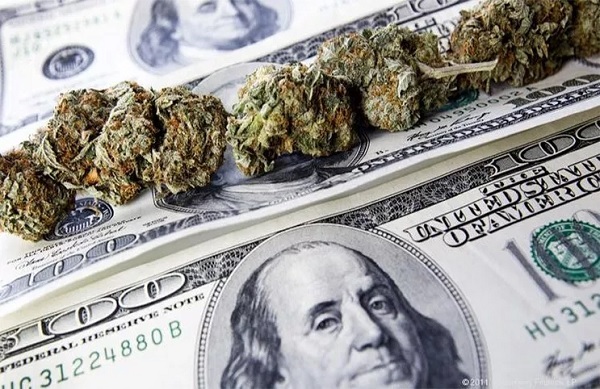 Until now, that’s made it virtually impossible for everyday investors to cash in on the lucrative marijuana trade (unless you prefer the outlaw lifestyle). The global marijuana market is enormous. The United Nations estimates it to be worth around $150 billion annually. I think that’s conservative. Nothing on earth is growing faster than the market for legal marijuana. 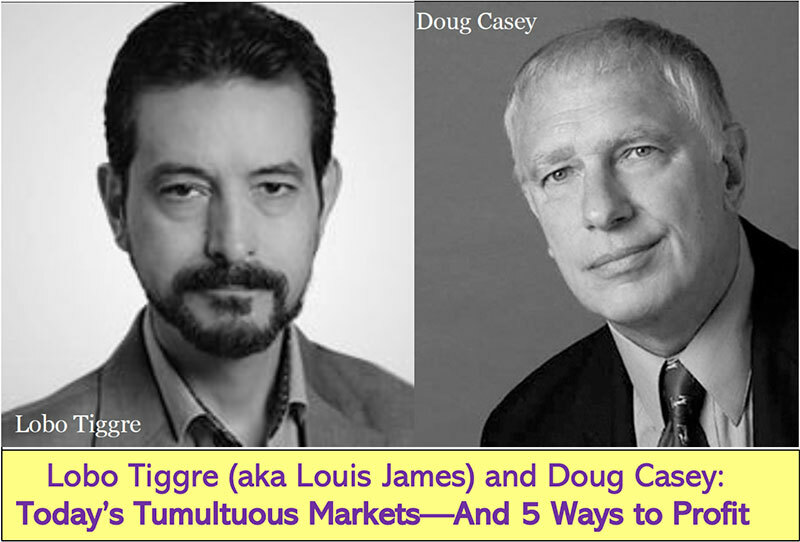 If you want to make a fortune from the pot bull market of 2018, you're invited to join Nick Giambruno and special guest Doug Casey in this free training event. Simply reserve your spot and you’ll discover how Doug became a marijuana millionaire and 5 stocks set to soar this year. 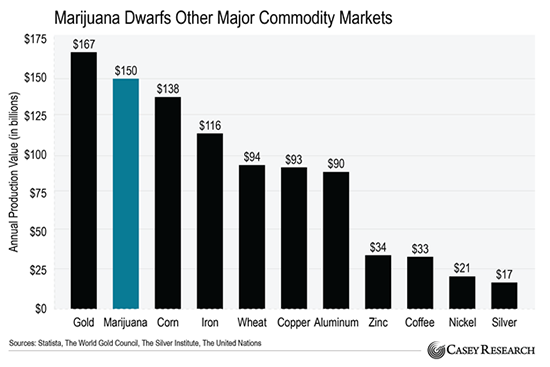 To put that figure in perspective, the marijuana market is about nine times larger than the silver market. It’s also larger than the iron, copper, aluminum, coffee, corn, and wheat markets. You can see how these commodity markets stack up in the chart below. 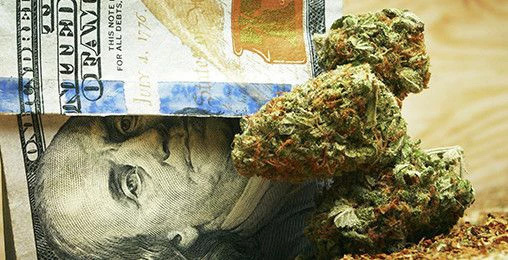 For decades, prohibition has funneled hundreds of billions of dollars in cannabis profits to drug lords, corrupt government officials, and thugs. In the past few years, attitudes toward marijuana have radically changed. Over a dozen countries in Europe and Latin America have recently softened their marijuana laws. Now the momentum has reached a tipping point. In some places—like Canada—complete legalization is imminent. This could even happen in the United States over the next few years. You might find that hard to believe. After all, the US federal government still classifies marijuana as a Schedule 1 drug. In other words, the feds consider marijuana as dangerous as cocaine or meth. The good news is this ridiculous policy probably won’t last much longer. After all, 29 states (plus Washington, DC) have already legalized medical marijuana. And eight states (plus DC) have approved recreational use. Just look at Colorado. In 2016, its marijuana industry generated $1.3 billion in sales. It also created 18,000 new full-time jobs. And that’s just one state. California’s marijuana industry is set to create more than 100,000 new jobs by 2020. Of course, many people worry the Trump administration will shut down the industry. And there’s good reason to be nervous. Trump’s attorney general did call marijuana “slightly less awful” than heroin. Comments like this have kept a lot of people from investing in marijuana. But consider the bigger political picture. First, the industry is too big to shut down. There’s simply too much money and too many jobs at stake. The backlash would be overwhelming. Second, states’ rights matter to Trump voters. Cracking down on the industry would alienate the people who put him in office. There would be little political benefit, and a lot of political cost, if Trump went after the US marijuana industry. It wouldn’t make any sense for him to do it. Nonetheless, the US marijuana situation is somewhat confused. And it will stay that way until the federal government changes its tune. That said, the federal government can’t win this war. I think it will surrender sooner rather than later, probably in the next couple of years. But for now, it doesn’t matter what the US does. That’s because there are other ways to profit off the marijuana industry. Right now, one of the best ways is to invest in Canada, which is at the forefront of the legal marijuana market. In 2001, Canada legalized medical marijuana nationwide. Since then, it’s been slowly moving toward complete legalization. It recently started the process of making it official. On April 13 of last year, Canadian Prime Minister Justin Trudeau fulfilled one of his biggest campaign pledges by introducing Bill C-45, the Cannabis Act, which legalizes recreational marijuana in Canada. This historic act will create a legal framework for the production, distribution, possession, safety standards, and sale of marijuana. It will allow adults in Canada to legally purchase and possess recreational marijuana from licensed providers. At that point, Canada will be the second country (after Uruguay) to fully legalize recreational cannabis. More importantly, it will become the first developed, large, industrialized, Western nation to legalize marijuana outright. This will have huge implications for Canada’s current $400 million legal marijuana industry. Accounting firm Deloitte estimates that Canada’s marijuana market could become a $4 billion to $9 billion market once recreational use is legalized. That means Canada’s legal marijuana economy is about to grow at least tenfold ($400 million to $4 billion) in size… almost overnight. And that’s probably low-balling it. One investment bank thinks that Canada’s marijuana market could soon be worth as much as $10 billion. 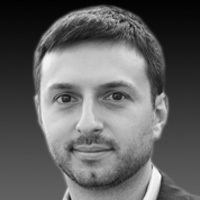 Others think the industry could blossom into a $20 billion market within a few years. That would make it more than three times as large as Canada’s $6 billion spirits industry. In short, Canada’s marijuana economy is about to explode. Canada isn’t equipped to handle the coming surge in demand. Right now, Canada has about 1.4 million square feet of licensed marijuana production space. That might sound like a lot. But it’s not even close to the capacity Canada will need to satisfy all its pent-up demand. In fact, some experts say Canada will need at least 14 million square feet of dedicated production space. That’s 10x more capacity than it currently has. To meet this coming surge, Canada’s marijuana industry will need to ramp up production dramatically. P.S. On January 1, California started selling legal recreational pot. California’s Green Rush will make Colorado’s market look like a tiny blip. And Canada is set to legalize recreational pot for the entire country later this year, taking the marijuana market to a whole new level. I think right now is a great time to invest in the legal cannabis space. 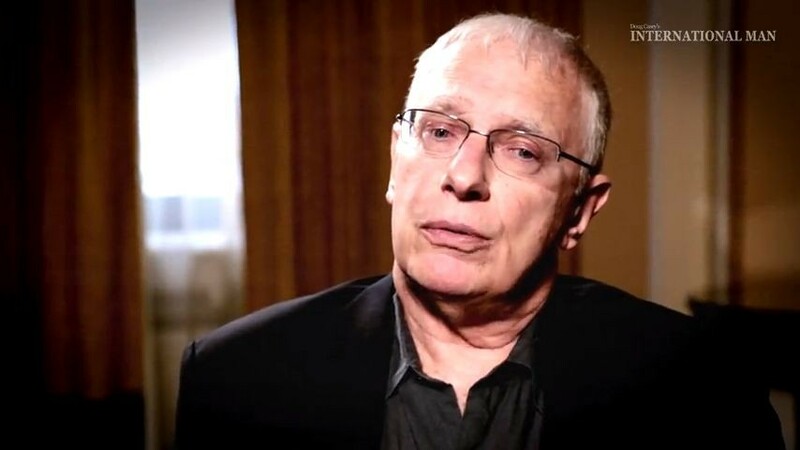 And there’s no better place to discover all the details on how you can join the party, too, than the Marijuana Millionaire Summit featuring famed speculator Doug Casey (a marijuana millionaire himself). The online webinar is free for you to attend. Click here for details.